Biography: Jean Little was born in Taiwan in 1932. Her parents were both doctors. Jean grew up in Ontario and graduated from the University of Toronto. She was born with an eye problem and is severely visually impaired. A special "talking" computer assists her with her writing. She has a retired seeing-eye dog named Ritz and a new one named Pippa, with whom she travels. The author focuses on her experiences from the time she was a child through young adulthood in her autobiography Little by Little and continues her story in Stars Come Out Within. The books, which will appeal to children aged ten and older, are both humorous and poignant as Jean describes living with a disability and the ridicule she sometimes experienced as a result, as well as her love for the world of reading and books. Jean's books include From Anna, Listen for the Singing, Stand in the Wind, Mama's Going to Buy You a Mockingbird, Hey World, Here I Am!, Look Through My Window, Emma's Yucky Brother, The Belonging Place and Mine for Keeps. Listen for the Singing was the Canada Council Children's Literature Award winner in 1977. Mama's Going to Buy You a Mockingbird was the CLA Book of the Year in 1985. Jean Little's first book, Mine for Keeps, won the Little, Brown Children's Book Award in 1962 and was republished by Viking Penguin in 1995. It tells the story of Sally Copeland, a ten-year-old with cerebral palsy, and her adjustment to being home after spending several years in a special school. 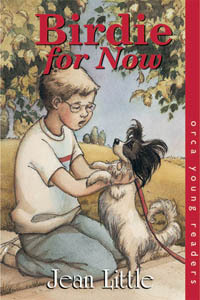 Several of the themes in this book appear in a number of the author’s other books: dealing with a handicap and the responses of others, fitting in, and adjusting to new situations and surroundings. By helping a small, abused dog, Dickon transforms himself. 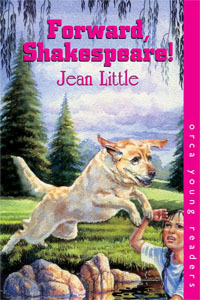 Shakespeare, a young guide dog, is about to change a blind boy's life.